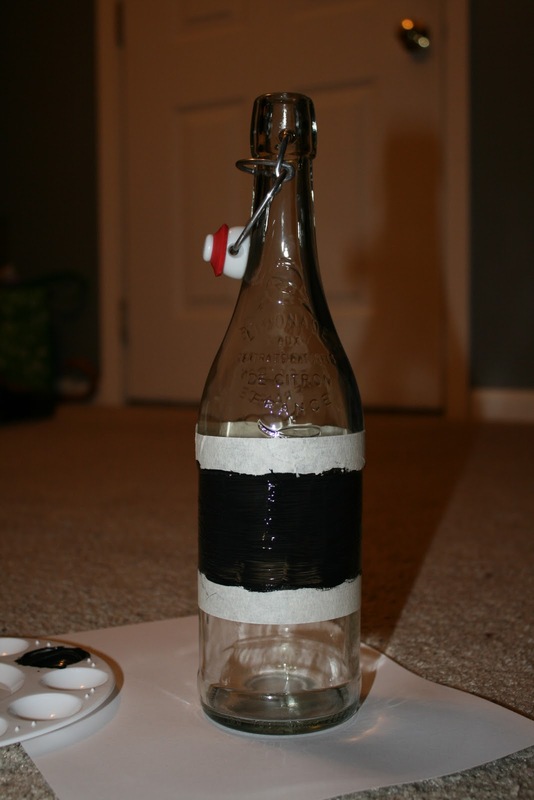 So a while back I did a post about making your own love bottles. Those of you who have been around me for any length of time know that I don't go *anywhere* without a bottle of water. But not just any water, no. It has to be in a glass bottle due to my severe paranoia of anything plastic coming in contact with what I ingest. I've been using all sorts of glass bottles to accommodate this insanity for some time now and was elated when Love Bottles came out. I saw this is a great opportunity to have something cuter than what I'd been going with. Unfortunately, Love Bottles are too expensive for my taste, and too small. They don't hold nearly enough water for this little camel. Instead I've been making my own now for much less, and I'll show you how, too! There are tons of great bottles out there that have the same fun shape as a Love Bottle. I like to get the French pop brand, Rieme, from specialty grocery stores or places like T.J. Maxx, Marshalls and Homegoods. It runs about $3.99/bottle, which isn't bad at all. You can drink the pop or give it away and then let the fun begin! 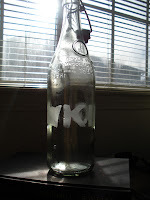 (1) Fill a sink with super warm water and place the bottle in it. Let it sit for an hour or two, the paper & adhesive will come right off. (2) Wash and dry the bottle. You can stop here if you like the plain look. (3) Decorate! VISIT THE OLDER POST to see how to decorate with tape, stencils, and paint. Or keep reading for chalk/etching. Chalk paint is a great way to spice up glass. I used Martha Stewart's brand, which is ok. You can purchase it at Michael's. A large bottle is around $7, unless you use a 40% off coupon (which I clearly did...). I taped off the section with masking tape and then applied 4 coats of paint, allowing it to dry between each coat. It worked perfectly! Follow THIS POST to read about glass etching. 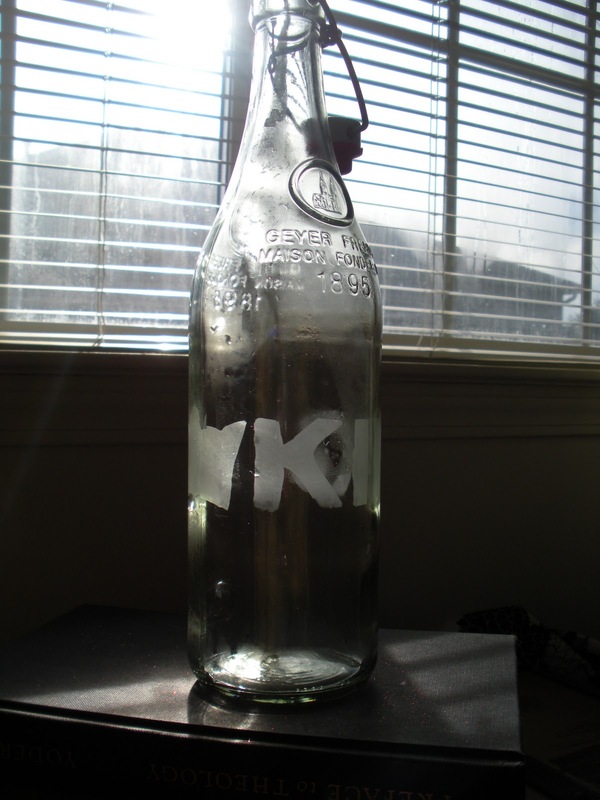 I etched another one of my bottles and it worked out really well, too. And there you have it! 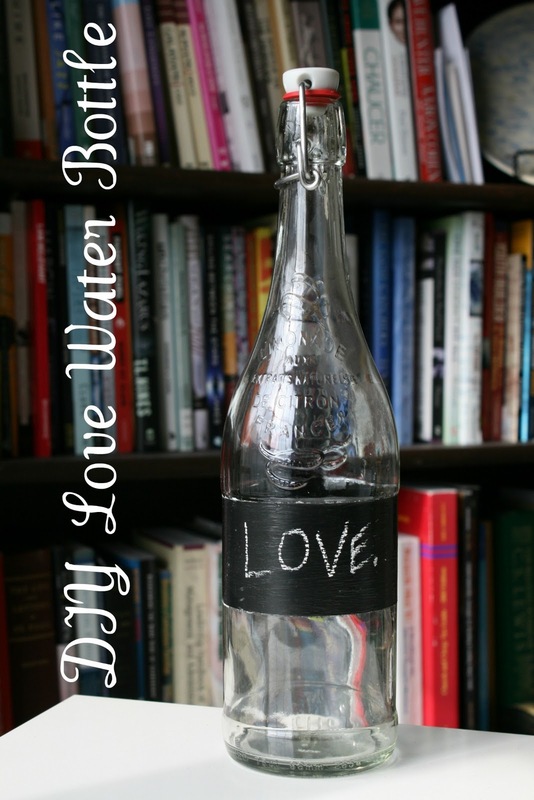 Two more fun ways to make your own Love Bottles. They're friendly to our planet as well as to your wallet and body. Did you know how much money you'll save by drinking tap water instead of bottled? Besides, a lot of bottled water isn't much cleaner than the tap version anyway!